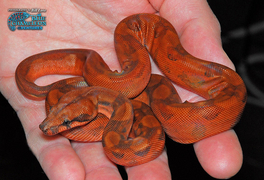 The First Blood Boas originated from a RED Boa that was found in El Salvador and owned by Ron St. Pierre. 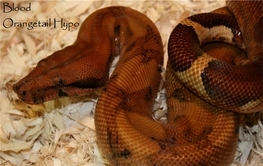 The Boa was line bred and was proven to be a genetic recessive trait. These boas like most Central American boas are true Dwarves. 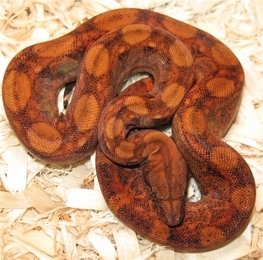 The Blood Boas max out at around 5 feet and have been bred at around 4 feet in length. They are very unique in head structure also. The Head is blunt and the eyes are dark. As youngsters they are literally Blood Red -- As Adults they tend to get darker burnt orange but still exhibit that blood red back ground color. This Trait is beautiful with out adding any of the genes on the market today. However, the sky is the limit with this trait & it most likely will boost the price of the stock of any other trait it is added to. 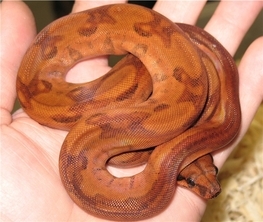 In 2007 I bred a Kahl strain Albino Boa ( mother to all my previous Coral Albino litters ) to a Blood Boa male. That breeding resulted in a litter of 100 % het for Albino & Blood ( double Hets ). I held back a few pairs & was fortunate enough to have a pair of these double hets breed in 2010. 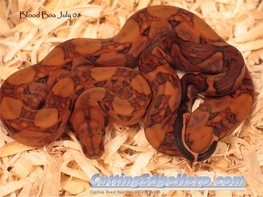 The result of this breeding was outstanding and it produced the first ever Kahl strain Albino Blood Boa. 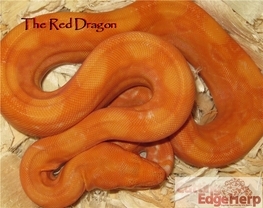 I decided to call this Red Boa the " Red Dragon " . I chose this name because it's commonly used in Asia. First because of the color Red which is the traditional color for wealth, prosperity and good luck. Secondly - the Dragon is a mythical creature, respected for its ability to change the world. 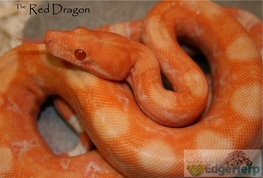 In this case - Im hoping that this "Red Dragon" Bloody Albino Boa can change the "Boa" world & open the eyes of the industry to realize the potential in these beautiful mystical ( and Mythical ) creatures.